Home > Headaches > What Causes Allergy Headaches? If you get a cold and suffer from sore, blocked sinuses, it is also quite common to get a headache. A blocked nose, nasal catarrh and a fever are commonly experienced with some type of head pain. It is therefore not too difficult to believe that people who are badly affected by allergies that cause upper respiratory symptoms are more likely to have headaches and several studies have certainly shown this. The causal link between allergy and headache is much less clear, and is something that is still hotly debated by various experts. Some theories have suggested that the allergic response can lead to a dilation of blood vessels in the brain and can therefore bring on a migraine. This is based on a rather outdated explanation of how a migraine develops so is unlikely to be true. Although people used to think that migraines and migraine pain were due to abnormalities in the blood vessels and blood flow in the brain, the currently accepted starting point for migraine is a disturbance in the way that electrical signals pass through the cortex. Migraines, particularly ones that are preceded by an aura, seem to develop as a result of cortical spreading depression, which is the root cause of the pain. There is no evidence that allergies can affect electrical signals in the brain so any headaches that are brought on by an allergy are not likely to be migraines. Some foods can trigger migraine – those that contain amino acids that mimic neurotransmitters. This is not a food allergy but a pharmacological effect of components of the food on receptors in the brain. 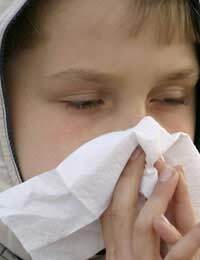 The evidence for a link between allergies such as hay fever and sinus headaches is much stronger. The nasal congestion and inflammation that occurs when you get hay fever is very likely to trigger swelling in the lining of the sinuses and this is a common cause of non-migraine headache and facial pain. By taking anti-histamines regularly, the inflammation that leads to sinus pain can be avoided – this is particularly important in teenagers who are taking exams in May and June, when the pollen count can be at its highest. When looking at evidence that may link allergies and headache one thing that may explain why so many people believe that allergies and headaches are linked is the simple fact that they are both very common. Over half of all adults report having headaches at least one each month and allergies are very common, particularly in children. If you have the symptoms of an allergy and then develop a headache, it doesn’t necessarily mean that the two are linked. An allergy is a very specific response to a tiny amount of the substance but larger amounts of substances in the environment can cause problems. Being sensitive to something means that you react in a more exaggerated way than most people. For example, if you are sensitive to histamines in food, you may find eating a ripe banana makes the inside of your mouth feel itchy and furry, or that some foods tend to make you sleepy or give you a headache. Food intolerances can also affect more than the digestive system. Wheat allergy is often accompanied by lethargy and chronic headaches. If you have an allergy and experience headaches often, it is sensible to see if changing your diet, or getting a better anti-allergy treatment can help. All too often, though, it is easy to blame headaches on an allergy if they are both bothering you and to miss the real, underlying cause of both health conditions. Your doctor may be able to provide a more objective view and can check for anything more serious. Just having the all-clear can put your mind at rest and not worrying about niggling aches and pains can be the first step to coping with them.